Try FloEFD for Solid Edge on the Cloud for 30 days. Free! Take your Solid Edge® designs to the next level with FloEFD™. 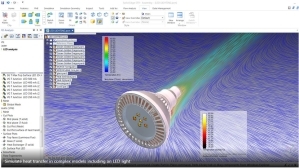 Find out how you can unleash the power of fluid flow and thermal simulation on your design to quickly evaluate options, optimize performance and increase reliability on a virtual PC. The FloEFD for Solid Edge Virtual Lab includes 20 comprehensive tutorial problems including pressure loss, heat transfer, porous media, mesh optimization, non-Newtonian flow, rotating impeller, among many others.